The plan? ..Well you need a Chocolate Advent Calendar for Business Gift with tasty chocolate treats to mark the daily countdown to Christmas Day!! Perfect on a budget - you needn't worry about breaking the budget this year. 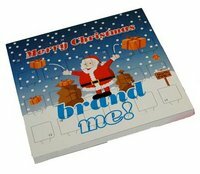 Customers will absolutely adore these Logo Branded Chocolate Advent Calendars and as a good-will gesture why not hand these out to potential customers and clients to make sure you spread around some reciprocation and good-will about?